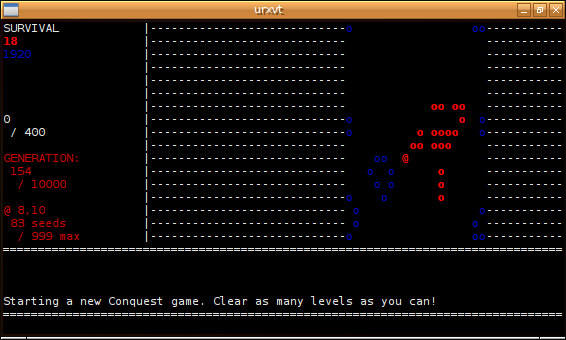 After slapping together six or eight angband derivatives yesterday, I feel inclined to hold up a “roguelike” title as an example of something innovative that can be done with the trope. If that’s what you’re expecting today, I can deliver: Here’s hack-of-life. I’m going to go out on a limb and say that hack-of-life is the only title in the universe that splices the roguelike interface on to the classic Conway’s Game of Life. If that sounds bizarre, it is at first. But when I say it’s the “roguelike interface,” what I’m really talking about is the eight-directional approach, with keys dedicated to other specific functions. So no, you won’t be fighting to preserve your cellular growth with a vorpal sword you won off a wayward gnoll, but there is some rogue-ish-ness to it. In short, your goal here is to dominate the board in the generations that remain in the game. You drop a “seed” with the greater-than key, and trigger its growth with a space. You harvest a seed from a mature cell with the comma. And this where the rules of ‘Life kick in, since a single seed growing alone will die out, but clusters will propagate and expand. If you know the classic patterns and self-propagating arrangements of ‘Life, you’ll have a jump start at hack-of-life. But things get wonky when an opponent’s colonies interfere with the growth of your own. ‘Life’s rules on expansion must be followed, but the addition of a few more game-specific rules complicates things in a delightful way. From a strictly mechanical standpoint, hack-of-life has plenty of the requisites I look for in good console programs, let alone good games. It’s got color, can adjust to oddball terminal sizes, it’s menu-driven, and has some onboard assistance. The config menu allows you to adjust almost any aspect of hack-of-life, which is a fun thing to play with. But it can also “save” games, has a “stasis” mode which seems to work like a pause button, a “view” mode, which allows you to peruse game boards that are too big for your console, plus some networking and chat provisions. And it seems prepared to handle up to six players at a time, which is rather remarkable for a console title. Again, maybe it’s not fair to lump this into the “roguelike” category since there’s not a lot here — aside from the general controls and use of the atpersand as your designator — that hearken back to the rogue genre. This entry was posted in Linux and tagged game on 2015/03/15 by K.Mandla.